I remember being force fed this as a child. I absolutely hated it! But times have a changed and the recipe I use is much tastier than the stodgy sliced slop I was made to eat. A beautiful Turkish recipe that leaves a warming cinnamon taste in the mouth. In a medium pan, gently boil the rice with 3/4 cup water for 15 minutes until most of the water is gone. Add the milk and cinnamon stick and bring to a boil. 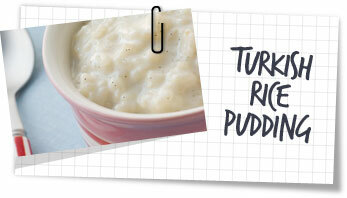 Simmer gently for 40 minutes stirring occasionally until the rice is creamy but not too stodgy. Take care to stir enough and avoid the rice sticking. Add a little more milk if necessary to get the right consistency then stir in the sugar and remove the cinnamon stick. Spoon into a small bowl then sprinkle over the pistachio nuts and drizzle over 1/2 teaspoon honey.